We all know and remember the traditional words of the wedding vows, but how serious are we about some of those phrases? How far would you go for your spouse? 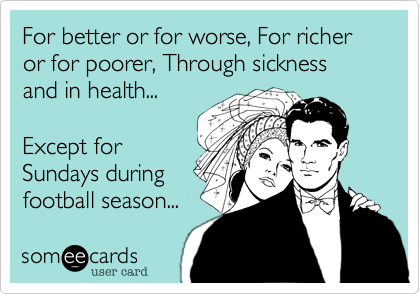 In the early days of marriage, it’s easy to think that life will be blissfully easy forever. Or maybe, it’s not so easy and you think that this is the absolute worst it can ever be. But what would you really do for your spouse? Are you in the honeymoon stage where everything is rose-colored and a-ok? A marriage is between two totally imperfect people and life is highly unpredictable. 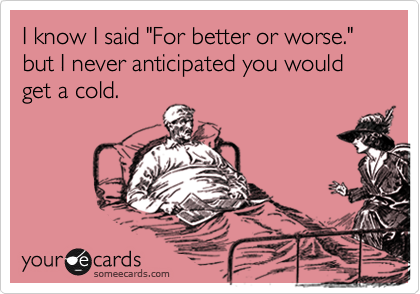 When things get crazy, money gets tight or health goes nuts, how far do you take those words “for better or for worse”? Are you in this newlywed game for the long haul or just until the “chocolate runs out”? Would you donate an organ? One blogger just recently donated a kidney to her husband. Another wife goes to sleep every night beside her husband of 53 years who is suffering from the latter stages of dementia. Would you go into bankruptcy? Newlyweds often experience financial hard times. If one person is a spender and another a saver then there are going to be credit card problems and possible bankruptcy. Do you take on your spouse’s debt or keep your finances separate? What happens to a marriage if one member of the relationship is unfaithful to the other? Is it best to part ways, stay together and say this is one of those growing times or forgive and forget? Do you think it’s important or wise to honor the commitment of this vow or are they just pretty words that are said when the candles are lit and everyone is saying “happily ever after’? 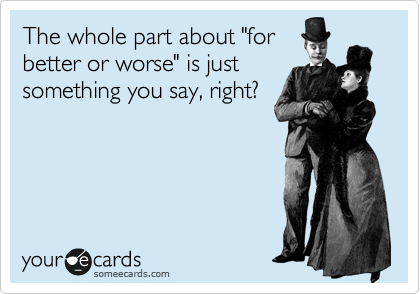 What do the words “for Better or for Worse” mean to you? I would stand by my husband for any and all of those things right up until infidelity. I told my husband before we got married if there was ever abuse or infidelity that is when the -"Til death do you part" clause took effect and he better run faster than me. Love it, Jennifer! And knowing you, you could definitely run faster!